There are other, large areas of their work that are similarly well-served by social platforms, such as behaviour-change campaigns designed to help prevent fires starting in the first place, and recruitment campaigns to attract young and diverse talent to the services. 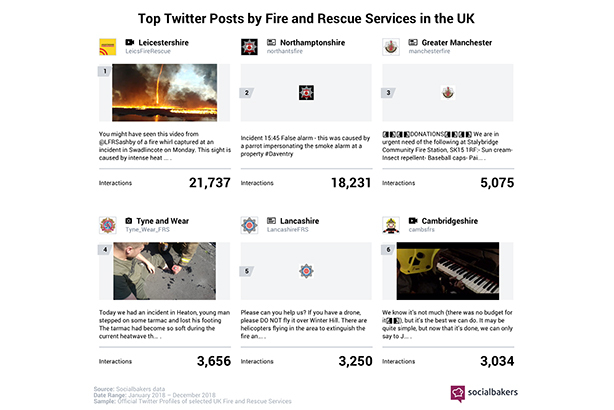 Exclusive research for PRWeek by the social media marketing platform Socialbakers reveals how the UK's fire and rescue services performed on three key platforms during 2018. To arrive at our conclusions, we measured the main corporate accounts of the UK's 55 fire and rescue services, including Crown Dependencies such as Jersey, as well as four specialist services, including Defence Fire and Rescue. Commenting on the overall results, Yuval Ben-Itzhak, chief executive of Socialbakers, told PRWeek: "The best place to reach a broad and highly-engaged audience is on social media. We see it playing an increasingly important role for public safety organisations, for education and awareness right the way through to real-time updates and guidance. If you want to pass your message quickly, pass it on social." According to a November study by YouGov, Facebook is the most popular social-media platform in the UK. It is also the most popular platform for the baby-boomer and Generation X demographics and the second-most-popular among millennials. More than 60 per cent of women, and 45 per cent of men, have a positive opinion of the network. 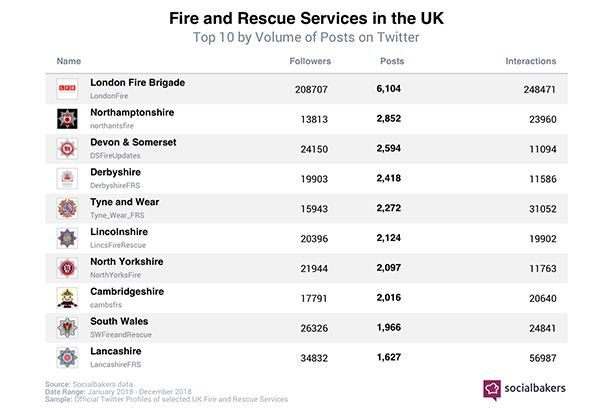 Leading the battle for fans on Facebook was London Fire Brigade, with nearly 102,000 followers, more than double the total of its nearest competitor, Scottish Fire and Rescue, which had nearly 42,000. 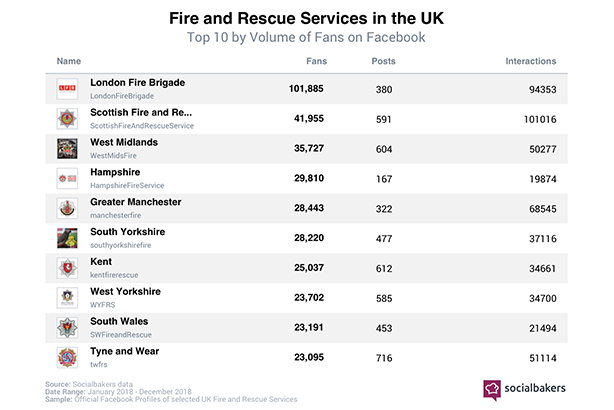 Completing the top five for Facebook fans were West Midlands, Hampshire and Greater Manchester Fire and Rescue Services. 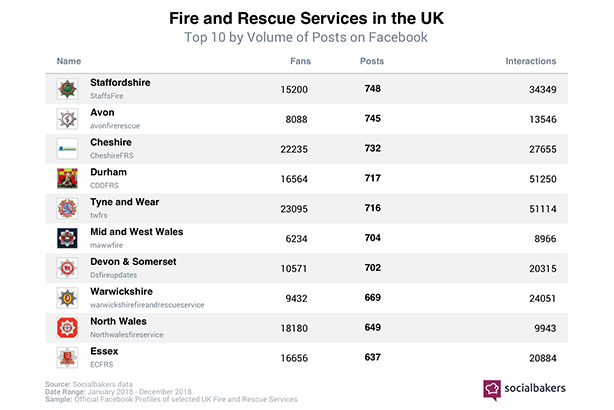 The most prolific service on Facebook was Staffordshire Fire and Rescue, which managed 748 posts over one year and squeaked ahead of its nearest competitor, Avon Fire and Rescue Service, on 745. Filling out the top five in this category were Cheshire, Durham and Tyne and Wear Fire and Rescue Services. 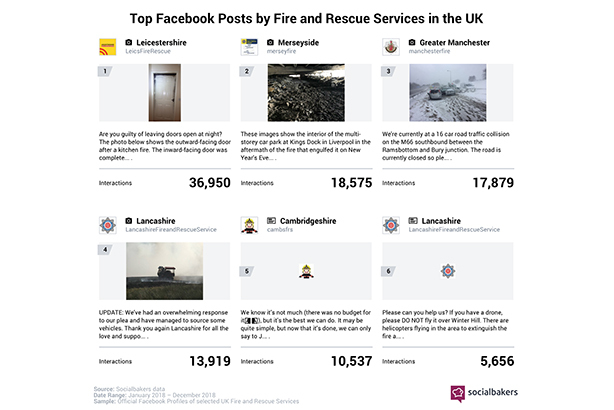 Commenting on the results, Sarah Davison, marketing and comms manager at Staffordshire Fire and Rescue Service, said: "Facebook is a key channel for us to share important safety messages with our communities, as well as news about ongoing incidents and upcoming events." She added: "Initially, we mainly used the page for prevention messages, but over the last couple of years we've broadened our content. It's now more varied and we use short videos and images where possible, something which has definitely increased our reach and engagement levels." One of the most important measures of effectiveness on a social-media platform is not the number of fans or posts but how much the public interacts with the posts. By this measure, the clear leader on Facebook was Scottish Fire and Rescue Service, with just over 101,000 interactions, including likes, comments and shares, compared with 94,000 for its nearest rival, London Fire Brigade. 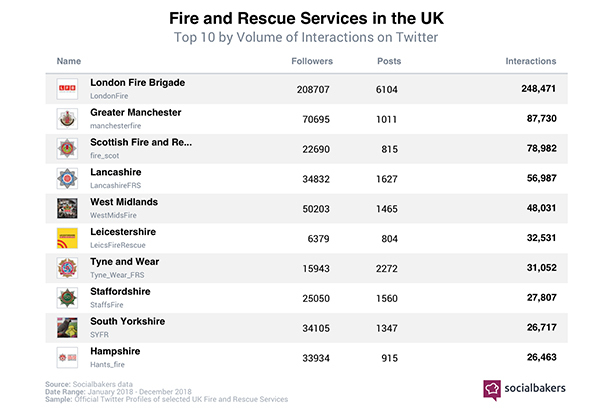 Making up the top five for interactions were Lancashire, Greater Manchester and Leicestershire Fire and Rescue Services. Mark McAteer, director of comms at Scottish Fire and Rescue Service, said his team had worked to harness key social-media platforms to showcase its work and attract a more diverse workforce. Commenting on the findings, he added: "This result is therefore fantastic news and pays tribute not only to our communications team and its bold and engaging approach, but all of our staff who support that effort - and, of course, communities here in Scotland and throughout the world who clearly value our Service." The research also sought to identify which single fire and rescue service post garnered the most interaction during 2018. Leicestershire Fire and Rescue Service led the field in this category, with a behaviour-change warning for people to close internal doors at night – a simple post that garnered nearly 37,000 interactions. 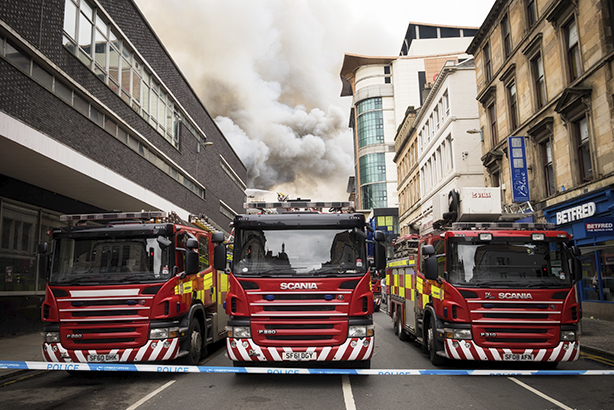 Completing the top three was a post by Merseyside Fire and Rescue showing the aftermath of a fire in a multi-storey car park, and another from Greater Manchester Fire and Rescue detailing its efforts following a 16-car road accident last winter. According to YouGov, Instagram is the second-most-popular social-media platform in the UK, overall, and the platform of choice for the millennial generation. It is the third-most-popular among Generation X and the sixth-most-favoured by baby boomers. More women than men favour Instagram – 48 per cent compared to 37 per cent. 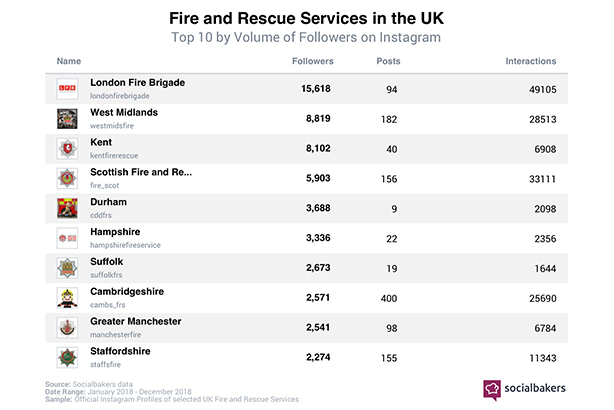 London Fire Brigade led the charge on the picture-based platform with more than 15,000 followers, significantly ahead of its nearest competitor, West Midlands Fire and Rescue, which had almost 9,000. Making up the top five were Kent, Scottish and Durham Fire and Rescue Services. 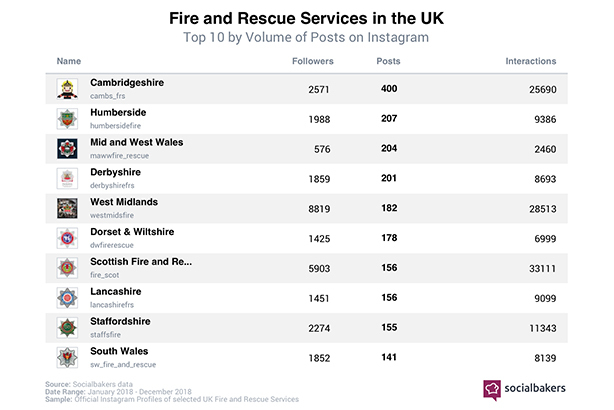 The most prolific team on Instagram was Cambridgeshire Fire and Rescue Service, with 400 posts over the course of the year – double the number of its nearest competitor, Humberside Fire and Rescue Service. Filling out the top five in a tight field were Mid and West Wales, Derbyshire and West Midlands Fire and Rescue Services. Hayley Douglas, head of media and comms at Cambridgeshire Fire and Rescue Service, told PRWeek the Instagram platform was growing in usefulness for the comms team, allowing it to reach different audiences and tell its story. She added: "From sharing safety messages to updating the public on incidents, or simply posting a good photo, we use it show what we do as a fire service, as we do so much more than people think. There are many myths about the fire service and we can get across many different messages in one photo or a short story – such as showing photos of women firefighters, firefighters out in the community delivering safety messages and not just putting out fires, or the hidden roles behind the scenes, such as control operators or our professional support-service staff." 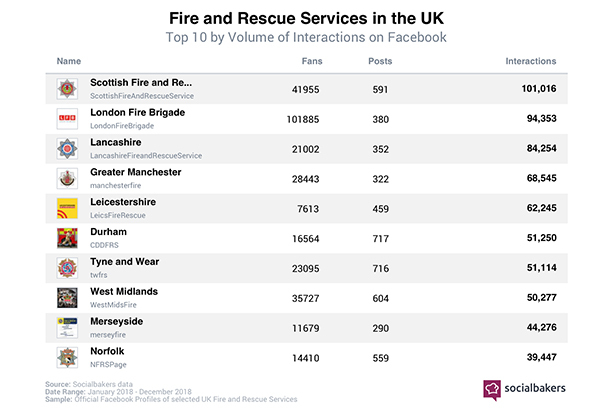 Once again, the best measure of use of a social-media platform is interactions and it was London Fire Brigade that led the field here, with just over 49,000 likes, shares and comments in the year, compared with 33,000 for Scottish Fire and Rescue. Completing the top five were West Midlands, Cambridgeshire and Staffordshire Fire and Rescue Services. The research looked at the individual posts that garnered the most interaction on a given platform during 2018. 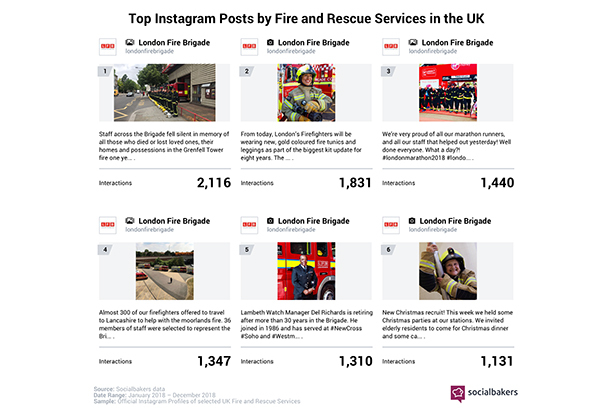 London Fire Brigade swept the board in this category with all six of the top single posts for interaction, leading with an emotional post, on the first anniversary of the Grenfell Tower disaster, that received more than 2,000 interactions. Other LFB posts to make the top slots included one to showcase its firefighters' new uniform and another offering help to Lancashire Fire and Rescue Service during its efforts to battle the Winter Hill moorland fire last summer. Commenting on the findings, Glenn Sebright, assistant director of comms at LFB, said: "Instagram takes you behind the scenes of our work to meet firefighters, control officers and safety teams, and via Twitter you can follow serious or unusual incidents from beginning to end. Getting up-close to what we do has never been so important. Through these access channels we share safety content people notice and act upon; we demystify what being a firefighter is really all about; and we influence, which, post-the Grenfell Tower fire, is fundamental to public safety in the capital." YouGov rates Twitter as the UK's fourth-most-popular social media platform, with its highest user base among millennials, followed by Generation X and, finally, baby boomers. More men than women preferred Twitter, by eight percentage points. 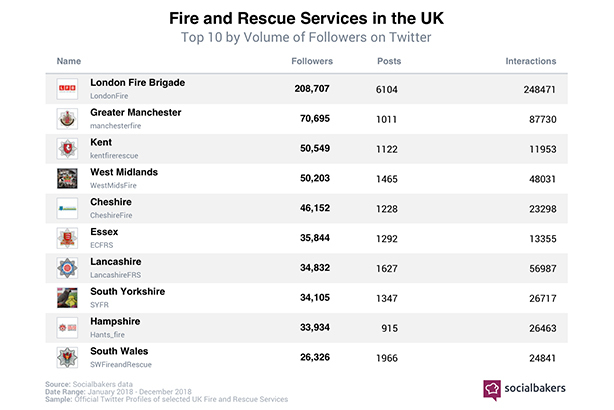 Once again, London Fire Brigade challenged all similar services in the UK, with nearly 209,000 followers, nearly three times the number of its nearest rival, Greater Manchester Fire and Rescue Service, on almost 71,000 followers. The remaining top-five fire and rescue services were Kent, West Midlands and Cheshire. London Fire Brigade also led the way for the number of posts it put out in a year; 6,100, compared with second-placed Northamptonshire Fire and Rescue Service – now run by the region’s police and crime commissioner – on nearly 2,900 posts. Completing the top five were Devon and Somerset, Derbyshire, and Tyne and Wear Fire and Rescue Services. In pole position for interactions, once again, was London Fire Brigade, with nearly 249,000 likes, shares and comments on its tweets. This was nearly three times the number achieved by its nearest competitor, Greater Manchester Fire and Rescue Service, on almost 88,000 interactions. Making up the top five in this category were Scottish, Lancashire and West Midlands Fire and Rescue Services. LFB's Sebright said: "We're proud to be recognised as one of the most effective fire and rescue services in the UK on social media, reflecting how well the organisation has embraced it and the hard work of the press and digital teams at London Fire Brigade." Research also uncovered the single most-effective Twitter posts during 2018, in terms of interaction. Topping the list here was an eye-catching picture of a 'fire whirl' from Leicestershire Fire and Rescue Service, which attracted nearly 22,000 interactions. Other top posts included a tongue-in-cheek effort by Northamptonshire Fire and Rescue Service about a parrot that impersonated a smoke alarm, precipitating an emergency call-out. Commenting on his team’s efforts, Dominic Halliday, media and comms officer at Leicestershire Fire and Rescue Service, said: "Sharing the fire whirl on our Twitter account brought unexpected worldwide coverage and interaction due to the rarity of something like this happening, especially here in the UK. Similarly, the fire door Facebook post attracted huge national attention, and we believe this was due to the fact it is a post that people can easily relate to." He added: "Both of these posts have helped increase our following in our local communities and further enhanced our ability to communicate with them, spreading our vital safety messages and ensuring we create safer people and safer places." More than 10 years of national cost-cutting measures have left the majority of public-sector organisations, including emergency services, working within limited budgets. Naturally, this has had an effect on the comms teams that support frontline services, but it could be said that necessity has been the mother of invention as they have developed innovative strategies to communicate with the public via the most cost-effective means possible. Social media, although not a cost-free option, has served the UK’s fire and rescue services well. The platforms provide a direct means of communication with the public, allowing services to showcase the varied work they do, offer life-saving behaviour-change advice and attract a new generation of young and diverse talent into their ranks; all for the price of a well-trained comms professional, adept at using social media. 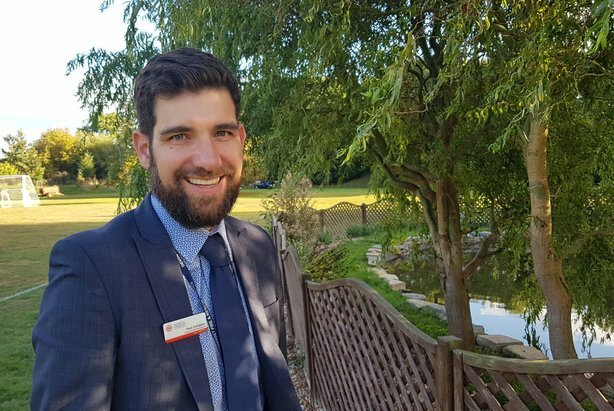 Social media can also help to fill the void left by the decline in the number of local newspapers, argues Paul Compton (pictured), chair of FirePro and head of comms and engagement at Devon and Somerset Fire and Rescue Service. He said: "It’s crucial that fire and rescue services put more focus on building good connections on social media. With the ongoing decline of local newspapers, we have seen a huge rise in communities coming together to discuss local issues on social media. Fire and rescue services have been frontrunners in this area, with some outstanding original content surfacing in recent years as well as textbook crisis communications." Compton said research showed that Facebook was one of the top platforms used by people to interact with their local fire service. He concluded: "There are great opportunities to do more, but communicators need to be supported with budgets and trusted to be brave and bold."